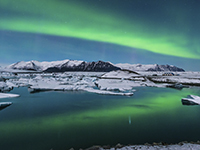 Among the sights to behold in Iceland include exploding geysers, the warm waters of the Blue Lagoon and Aurora Borealis, one of the seven natural wonders of the world, which under the right conditions can provide spectacular displays. Around 137,000 British nationals visited Iceland in 2013, which can be accessed from the United Kingdom by airplane or a considerably more complicated ferry and train trip. The Icelandic Krona is the currency of Iceland, although credit and debit cards are commonly used even for quite small transactions and money can be exchanged at all banks and most hotels. Travelling from London to Reykjavik on a non-stop airplane service can take as little as three hours with certain airlines, although this can easily rise to between 12-15 hours depending on your flight selection. For those looking to avoid airplane travel, an alternative can be found by using the Faroe Islands' Smyril Line ferry service, which operates from Denmark and is the only way to bring your car to Iceland. Trains from London to Denmark can normally take up to a couple of days, if you are looking to travel without your vehicle, with passengers booking this route recommended to allow between three and four days overall to reach Iceland. The time difference in Iceland is one hour behind British Summer Time and the same as Greenwich Mean Time, which should not require you to alter your diabetes management significantly when you arrive. However, if you are unsure as to how to adjust your medication then you should discuss a plan with your diabetic specialist. Iceland is generally a very cold country compared to the climate of the United Kingdom, with the average high summer temperature in Iceland around 14°C. There are no mandatory vaccinations required to enter Iceland. However, the opportunity should be taken to ensure existing vaccinations such as your yearly flu jab and those against polio and tetanus are also up to date. Iceland is amongst the European countries that allow you to receive state healthcare either at a reduced cost or sometimes for free. It will cover you for medical treatment until you return to the UK. Medication is available in Iceland, but payment is required from a pharmacy, for which the Icelandic translation is ‘Apotek’. However, possessing an EHIC card allows you to receive treatment at a lesser cost and this money can be recouped when you get back into the UK. Most Icelandic pharmacies are generally open 1000-1800 during weekdays, which shortens to 1000-1600 on Saturdays. Pharmacies will be closed on Sundays and public holidays. Blood and urine testing kits are available from most pharmacies in Iceland. The emergency services number to be called in Iceland is 112. It is advisable to contact the manufacturing company of your medication prior to leaving the UK to find out what is available in Iceland if your medication gets lost, stolen or damaged. It is also worth checking to see what different names your medication may be listed as. You should note which syringes are available in Iceland, with U-100 syringes the most commonly used and available at all pharmacies. The vast majority of insulin in the UK is U-100 insulin. If you need to take a different strength of insulin, say in an emergency, it’s important that you use the correct device and syringes for that insulin. If I want to hire a vehicle during my visit, will I face any form of discrimination? No, provided you can show a doctor’s certificate or letter confirming that your diabetes. What sugar free drinks are available in Iceland? No, provided you can show a doctor’s certificate or letter confirming that your diabetes.